10 years has passed since the confrontation between Kira and L. Again, Shinigami sends death notes to the ground and due to this, the world soon falls into chaos. Tsukuru (Masahiro Higashide) is a member of the Death Note special task force team with 6 other investigators including Matsuda who experienced the Kira case of 10 years ago. 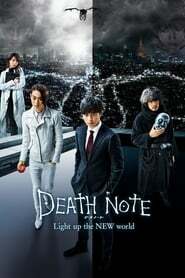 Mass murders caused by the death note takes place on Wall Street in the U.S., Shibuya in Japan and other places. World famous private investigator Ryuzaki (Sosuke Ikematsu), who is the rightful successor of L, also investigates the mass murders. They discover that 6 death notes exists in the world. A computer virus called Kira spreads in the world. A message in the Kira virus says to turn in 6 death notes. A person who has 6 death notes overwhelm the world. The confrontation begins between the person who wants Kira’s revival and the people who want to stop it. Kiyotaka Sato (Shuhei Nomura) is a university student. He is sociable, but he looks like he doesn’t have interest in those around him. During his summer vacation, Kiyotaka Sato plans to get his driver’s license to impress schoolmate Matsuda (Yukino Kishii). At this time, a yakuza boss (Ken Mitsuishi) orders Todoroki (Kento Kaku) to get his driver’s license. Todoroki doesn’t show his feelings outwardly. Later, Todoroki drives a car without a driver’s license and he hits Kiyotaka Sato. To cover up the accident, Kiyotaka Sato is placed in a car and taken to away. He arrives at an unofficial driving school. The driving school is run by the Uehara family. There, Kiyotaka Sato and Todoroki learn that they graduated from the same high school. They spend their summer at the driving school.